Abstract: Able to store 192MB worth of music in MP3 or WMA format, the roll-of-quarters sized YP-55i also includes a digital FM tuner. Does the world need another MP3 player? As I sit here pouring over the contents of Samsung's newest MP3 player, the Yepp YP-55i, it is a question that strikes me... and yet at first glance, the matt white finish of the Yepp player doesn't easily reveal an answer. For consumers who can afford the Apple iPod, there really is no reason to buy another MP3 player - the iPod handles it all, stores hours and hours of music, and flashes "the new black," glossy white, with great success. Still, $500-$700CDN is a lot to justify for something about the size of a deck of cards. Portability also comes into play. Do music lovers like carrying around an iPod for the morning jog? Probably not, unless they want to strap it onto a belt and look the 21st century equivalent of Adam West's 1960's Batman. Okay. The iPod isn't thaaaat large, but as MP3 players continue to come down in price, manufacturers are segmenting them for every part of our daily lives. Smaller, fixed memory players like the Samsung YP-55i are just fine for the morning commute, a trip to the store, a jog around the block, or whatever. 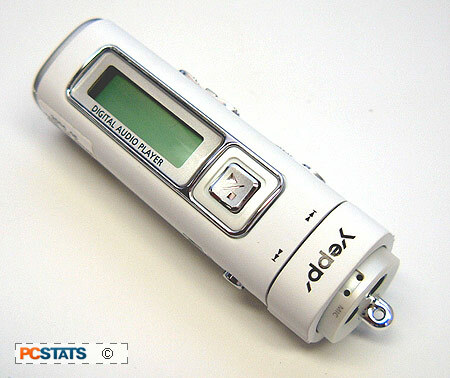 Able to store 192MB worth of music in MP3 or WMA format, the roll-of-quarters sized YP-55i also includes a digital FM tuner. It also offers the very neat capability of encoding FM-Radio to MP3 recordings on the fly; how cool is that!? Printed manual, driver CD, headphones, USB cable, direct-connect USB adaptor, mini-headphone line cable, neck strap, carry case, warranty card, and AAA battery to get you started. The Samsung YP-55i is like the Swiss Army knife of portable music players; it functions as a USB hard drive, offers up the ability to record voice memos, and of course... approximately 15hrs music playback time with one AAA battery. The AAA battery is included, but not of the rechargeable variety - so I'd recommend investing in them unless you like buying 8-packs of AAA's every other week. 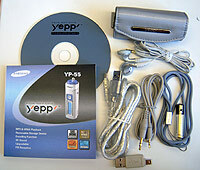 The Yepp YP-55i retails for about $200CDN, in the 192MB size. It comes in a nice matt white finish. The body is primarily made from aluminum, not plastic, so the YP-55i should survive longer stuffed in pockets, or sat on. Other YP-55 models range in memory sizes from 128MB, right through to 512MB. In each case the units internal firmware initially takes up about 7MB of space for itself. The firmware is upgradeable, so depending on what you install in the future, its size may increase. The internal memory size is fixed, and is not upgradeable. Pg 6. The YP-55i - MP3 Encoding on go!